It was the lighting that stood out. Not the bubbles of moss or rusty signs in Cyrillic, not the plastic dolls whose clothes had disintegrated years ago, but the beautiful, filtered light that I remember most from my visit to the Chernobyl Exclusion Zone. 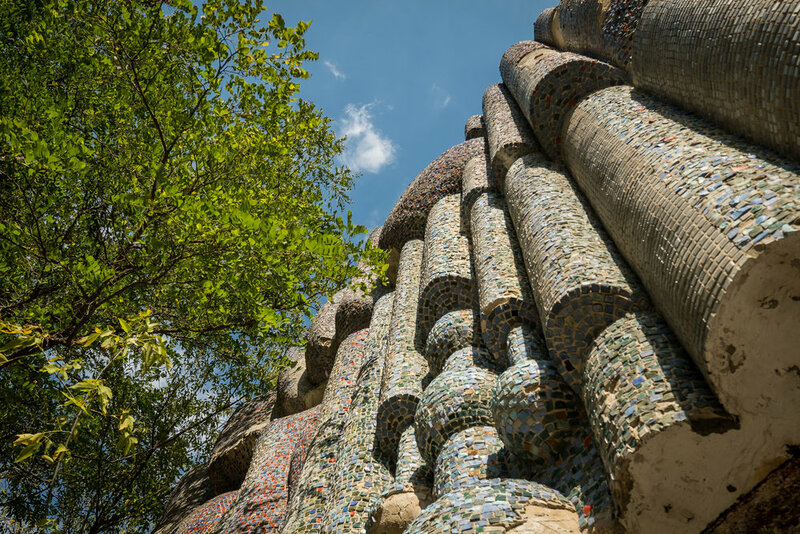 It streamed into the buildings of Pripyat through thick swaths of trees and dirty windows that hadn't seen a squeegee in decades, bathing the surreal setting in an ethereal glow that made me shiver with delight. Lighting is a photographer's best friend, they say, and paired with the gorgeous pastel-hued ruins of the Chernobyl disaster, it's difficult to take a bad picture in this corner of the former Soviet Union. Still, many of my pictures turned out grainier or more blurred than I had hoped, a result of being rushed through the most fascinating experience of my life and hungrily trying to capture every bizarre detail to later share my tale. As much as I wanted to, I struggled to stay close enough to tour guide Lara to hear the site's equally bizarre history and I became known in the group as the dreaded straggler. I did my best to keep up and absorb everything, but I couldn't help but feel overwhelmed. When the Chernobyl power plant disaster happened in 1986, Pripyat was a brand new city, having been built only in 1970 for the people working at the nearby Chernobyl power plant. (The city of Chernobyl is further away from the power plant and in the outer ring of the 30 kilometer exclusion zone radius from the power plant; people still live in Chernobyl and the city surprisingly dates to 1193 AD.) Everything in Pripyat is Soviet and a tad forced, from bland, boxy buildings to cheery portraits of Soviet leaders to cheap linoleum scattered everywhere. But there is a softer side to Pripyat, and bright color-blocked interiors and an abundance of recreational facilities, not to mention a grocery store stocked with more products than most citizens had seen in that era, paint Pripyat as a thriving, happy place for young Soviet citizens seeking a good job and family life. 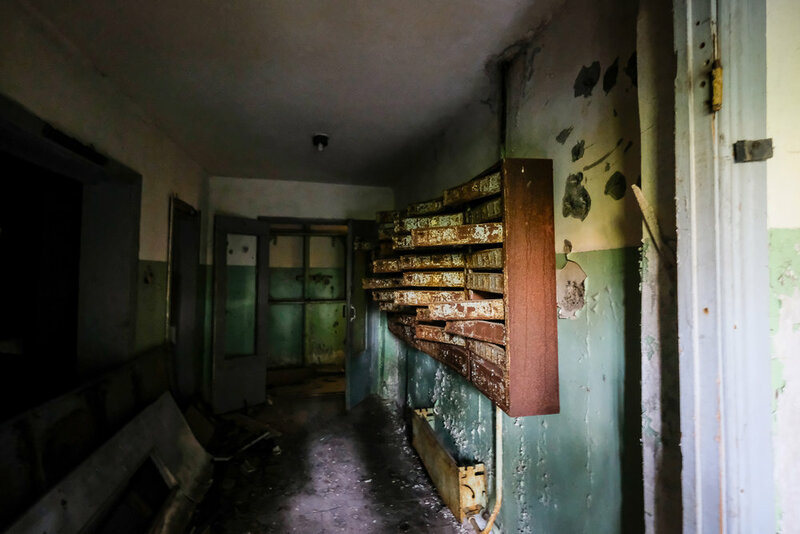 After the disaster, few residents returned for their personal effects and officials ransacked the buildings collecting contaminated items, so the many details left behind are scattered but still representative of Pripyat's solid middle class population. Most abandoned sites I've visited recently have tragically been picked over and vandalized by trespassers, so I was shocked by how intact Pripyat was (perhaps it's the radiation, or even watchful eyes of tour guides and armed officials, that keeps thieves at bay). And not just intact, but almost staged, because isn't it impossible for cities to go from a population of fifty thousand to zero overnight, and sit untouched for thirty years? After photographing the open visitor's log in the hospital, ink practically fresh from the last visitor in 1986, I turned to Lara and asked her if tour companies hired professionals to arrange such macabre mise-en-scènes. She looked at me with a blank expression, not understanding the question. "Never mind," I said, laughing and wandering down the dark hall. Pripyat was lifeless but teeming with life, if that makes any sense. You could stand there with your eyes closed and think you were alone, the deafening silence interrupted occasionally by clanking metal somewhere in the distance. But then you'd go into a building and see something like a chair pulled away from a desk with a newspaper spread out, as if someone stepped out for a cigarette thirty years ago and would be back any minute. It was bizarre, otherworldly, disorienting, beautiful. You are now entering Pripyat. 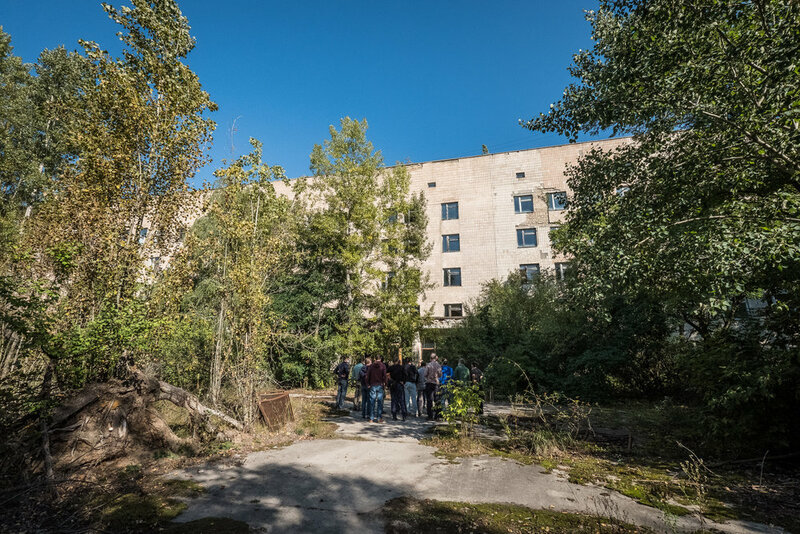 The hospital was our group's first true taste of the Chernobyl Exclusion Zone. We walked into the lobby, greeted by a receptionist-less reception desk and an open visitor's log. Next to the log was a small pile of rags: "That's a piece of firefighter's uniform, found in the hospital basement. It still emits lethal levels of radiation, so high your dosimeter can't read it. Don't touch it," Lara warned. She didn't take us down to that basement, where hospital staff discarded the remainder of hazardous clothes from firefighters and workers, but we did wander around Pripyat's former state-of-the-art hospital facility. A soft, muted light seeped into the white rooms through windows lined in plastic sheeting; shadows from the forest outside danced gently on rusty operating tables and glass vials half-filled with cloudy liquids. lobby reception desk: don't forget to sign in! The greatest victims of the Chernobyl disaster may very well have been the children of Pripyat, denied the pleasure of the town's new amusement park slated to open as part of the annual May Day celebration on May 1. Yes, children who had been sitting on their hands for months waiting for a go at the bumper cars and Ferris wheel were crushed when they had to evacuate on April 26. It's bizarre to think that this colorful wasteland was never in operation and the desolately pristine grounds today are deathly silent. There is no ghostly carnival music or children's shrieks at this abandoned amusement park, because, remember, those never existed in the first place. The video to the right shows the park in 1990, just years after the disaster; it's fascinating to watch, and the park is still in decent condition after just four years. When Lara asked the group if there was anything in particular we wanted to see, I requested that we see the inside of an apartment building. Not only did Lara take us inside one of the many towering residential buildings hidden in the trees, but she marched us up sixteen flights of stairs to the building roof. There, we were all left speechless for a few minutes as we took in the stunning panoramic view. From the top of the building, the entire town of Pripyat, the Chernobyl power plant, and Duga radar were all in sharp focus; thick green forests with patches of copper red (the Red Forest) filled in any gaps between the buildings. 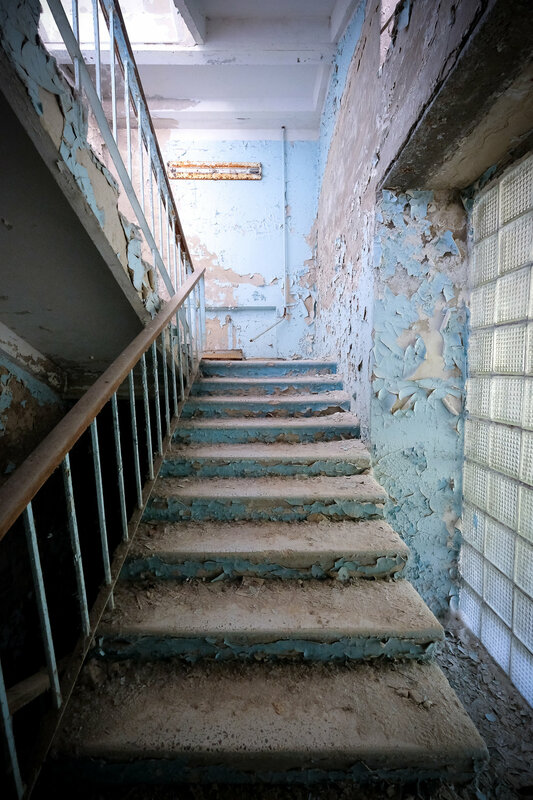 Inside the apartment building, a single cramped stairwell was the only means of ingress and egress for residents to access the dark, narrow halls leading to their one-room homes. Cheery paint colors failed to mask the crushing blandness of Soviet-era housing, but at least each unit had generous windows and views.